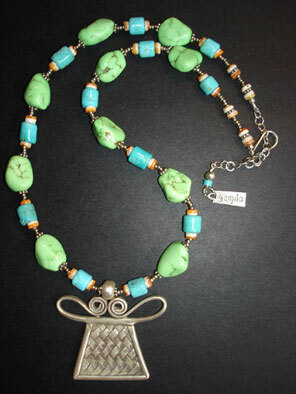 Gorgeous natural Mojave green turquoise nuggets are coupled with blue turquoise tubes, spiney oyster shell, Bali silver spacers and vintage steel cut seed beads. The combination of colours in this necklace is truly striking, and is further enhanced with a large Thai silver 'spirit lock' pendant. 9.25 silver clasp and extendable chain. Necklace length: 18.5 - 20.5"